Jojoba is a soothing plant, with anti-inflammatory and emollient properties. It has found many applications, from medicine to cosmetics, and also holds great potential as a source of renewable energies. 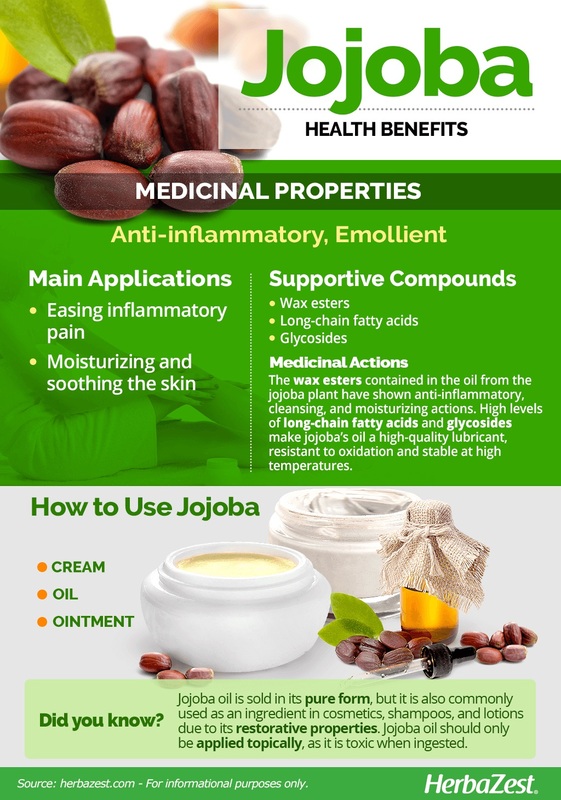 Learn more about jojoba benefits and properties. Jojoba is native to the Sonora Desert in northern Mexico and the southwestern United States and has been a highly valued plant for centuries. It is a folk remedy for colds, dysuria, poison ivy, sores, sore throat, warts, and other skin conditions. Today, jojoba's main industry is cosmetic, as it is used in countless skin and hair products for its restorative properties. Easing inflammatory pain. When applied topically, jojoba can relieve acne, skin redness, and eczema. Moisturizing and soothing the skin. 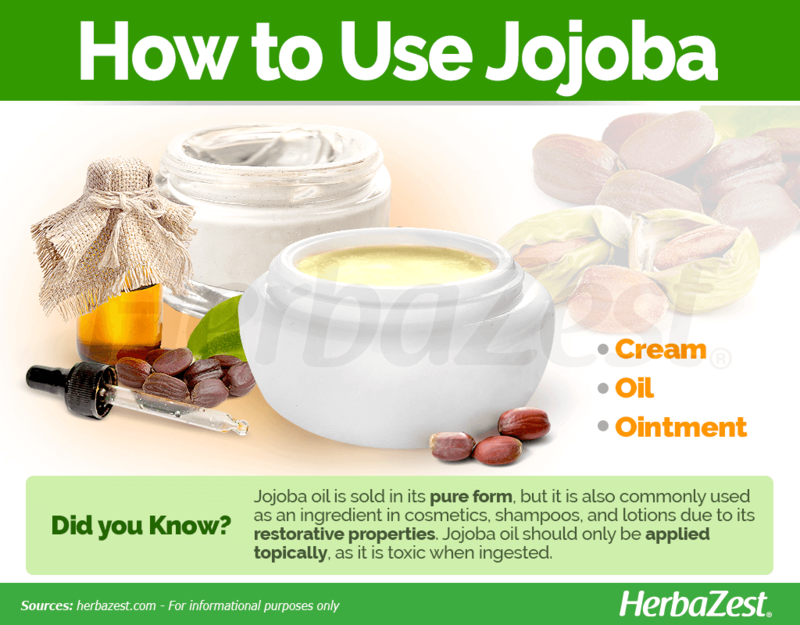 Jojoba's primary use is through its amazing skin care capacity. It is often used for moisturizing and soothing skin, as well as smoothing wrinkles and unclogging pores. Cleansing wounds and burns. 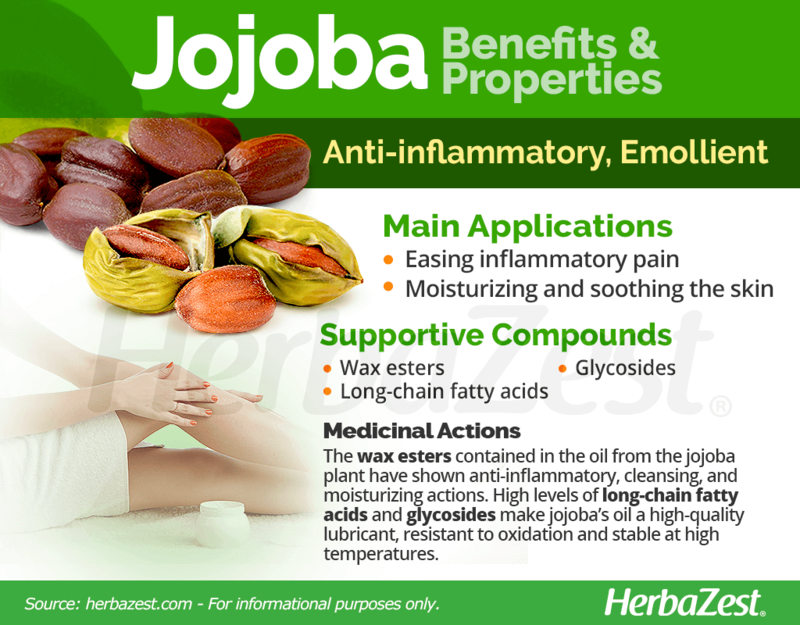 Jojoba was traditionally used for cleansing wounds and treating numerous types of burns, including sunburns. Soothing skin conditions. Jojoba has traditionally been used to treat skin conditions, such as skin rashes. Jojoba oil is technically a liquid wax extracted from the plant's seed. The liquid wax makes up about half of the seed's dry weight, and consists of a 60% mixture of wax esters, fatty acids, and glycosides. The wax esters contained in the oil from the jojoba plant have shown anti-inflammatory, cleansing, and moisturizing actions. 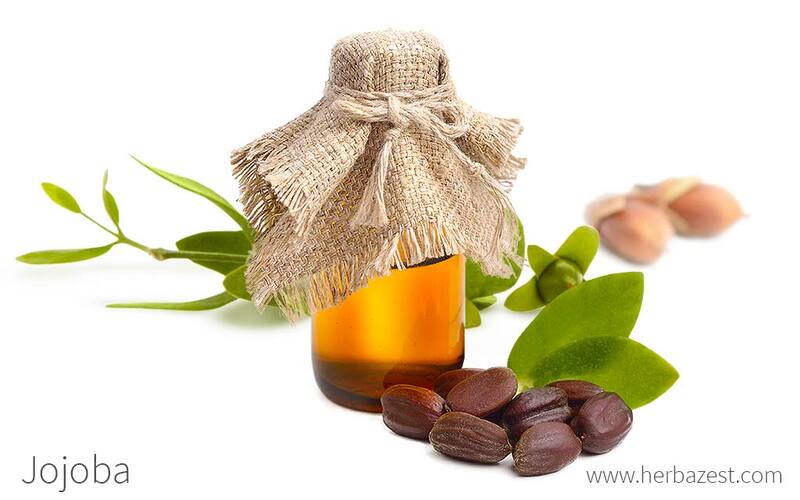 Jojoba is also useful for unclogging pores and hair follicles, promoting healthy hair growth and clear skin. Jojoba oil is highly resistant to oxidation and is stable at high temperatures. These properties make it a very high-quality lubricant. THE PROPERTIES OF JOJOBA WAX MAKE IT HIGHLY PRAISED IN THE SKINCARE INDUSTRY. Other herbs with emollient and anti-inflammatory properties are avocado, aloe, and greater plantain. Jojoba oil is likely safe for most people when applied topically, but it can cause minor skin irritation or rash in sensitive individuals. Jojoba oil is likely unsafe when taken orally. This is because it contains erucic acid, which can be toxic when consumed and can lead to heart damage. As it is considered toxic when taken orally, all of jojoba's medicinally properties can be found in its medicinal, topical applications. Cream. When applied as a water-based cream, which is easily absorbed, jojoba moisturizes the skin due to its emollient properties. It is can also be applied to soothe rashes and sunburns. Oil. In its most commercially popular form, jojoba oil, which is actually a wax, can be used to treat acne or eczema due to its anti-inflammatory properties. It is also used for the hair and scalp. Ointment. When applied topically, this oil-based preparation of jojoba relieves skin inflammation. Jojoba oil is sold in its pure, extract form. It is also commonly used in cosmetics, shampoos, and lotions because of its restorative properties. Jojoba products are available year round at most supermarkets, specialized health stores, and can also be purchased through online retailers. Jojoba prefers light, sandy soils that have a good drainage in order to allow adequate moisture. While very little water is required for growth, soils that contain nitrogen will help it thrive, especially during its first year. Jojoba needs full sun exposure in order to grow. The soil should have an ideal pH of 5 - 8. Jojoba plants are vulnerable to aphids, thrips, caterpillars, and grasshoppers. Jojoba plants are also vulnerable to deer and bighorn sheep. Jojoba is an evergreen shrub native to the Sonoran desert of southern California , north-western Mexico, and western Arizona. Its leaves are oblong, coarse, leathery, and can grow up to 2.5 inches (6.5 cm). Jojoba shrubs typically grow to 3.3 - 6.6 feet (1--2 m) tall. There are reports, however, of it reaching heights of 9.8 feet (3 m). Its flowers, which typically bloom between March and May, are small and greenish-yellow, with 5 - 6 sepals and no petals. Jojoba, or Simmondsia chinensis, is the only species within the Simmondsia genus, which is the single genus of the Simmondsiaceae family (formerly Buxaceae). Jojoba it is unique among plants in that its seeds contain an oil which is a liquid wax. Being Simmondsia chinensis the only member of the Simmondsia genus, there are no subspecies of this plant. However, many cultivars have been developed in Australia and Israel, among other countries, in order to improve yields and quality of this economically important crop. Jojoba scrubs were first referenced in literature in the 1789 by Mexican historian Francisco J. Clavijero, who noted that the Native American tribes of Baja California prized the fruit for food and the oil for medicinal purposes, such as treating cancer and kidney disorders. Native Americans have used jojoba for a wide range of purposes, including applying jojoba oil to wounds and other skin issues.They also applied the oil to aching eyes and joints and drank jojoba preparations for colds and to facilitate childbirth. When Heinrich Friedrich Link, a 19th century professor of botany and the director of the botanic garden of the University of Berlin, examined specimens of jojoba, he thought that they came from China and described the plant as a new species of Buxus (Boxwood) and named it Buxus chinensis. In 1836, Thomas Nuttall, an Englishman who spent 33 years in the United States as a naturalist and explorer, collected samples of jojoba near present-day San Diego, California, placed the plant under a new genus: Simmondsia, and named it Simmondsia californica. When J. Mueller recognized that Buxus chinensis and Simmondsia californica were in fact the same species, he chose Nuttall's name, but C.K. Schneider later proposed its current name: Simmondsia chinensis. Jojoba has been adapted to different countries and environments because of its high economic potential: today, 40,000 acres of jojoba are under cultivation in the southwestern U.S. Each jojoba plant may yield up to 11 pounds (5 kg) of seed (dry weight); approximately 50% by weight is the liquid wax, or "jojoba oil." One hectare can yield 2,480 - 4,960 pounds (1,125 - 2,250 kg) of oil per year, and recent prices are around $23 USD per pound ($50 per kg). In addition to its high demand in the cosmetics industry, the stability of jojoba oil makes it attractive to the electronic and computer industries. Jojoba is also cultivated as an oil crop in South America, Africa, and Israel. Personal care. because of its emollient properties, jojoba is used as an ingredient in shampoo and soap, as well as in lip balm, hair and scalp serum, and make-up remover. Electronic industry. The stability of jojoba oil makes it attractive also for its use in computers and other electronic devices. Alternative energies. Scientific studies suggest that jojoba seeds retain great energy value after oil extraction, which makes them a potential source of renewable energy that could replace the use of fossil fuels in some cases.